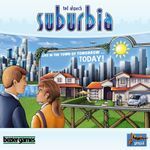 Includes Suburbia Inc. expansion. Pointless cardboard insert removed from box to fit expansion. Box *slightly* worn.